What is Pulsar 2849 like? 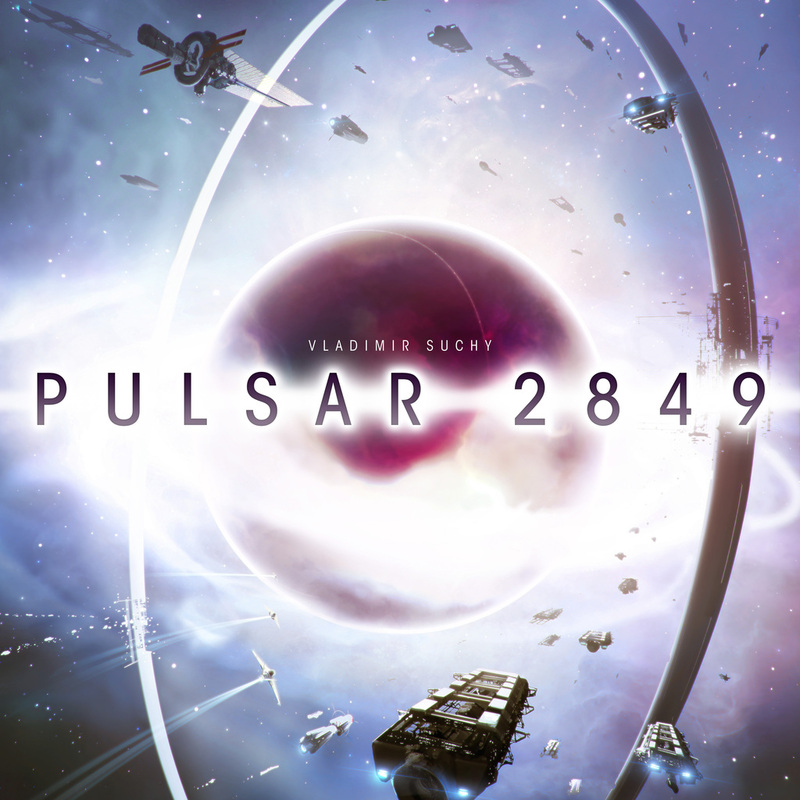 At its core Pulsar 2849 is a dice drafting game. Players take turns drafting a single dice from a pool that’s rolled every turn. Picking a high value die is normally more powerful, but forces you’ll have to move backwards on either, the turn order track or the engineering track. Taking the lower value dice will normally be weaker, but it will move you forwards you on the tracks mentioned above. Each dice draft will leave all players with 2 dice that will be used to perform various actions. You do this for 8 rounds, so you’ll get to do at least 16 actions. But you can get more actions. This is where the engineering track comes into the picture. Based on your position on that track, you’ll get a certain amount of engineering cubes at the end of every round. If you spend 4 of these you get to take an extra action, so as you can see these cubes are very valuable. There are also other ways to get them and they serve other uses as well. There are numerous actions you can do with your dice. 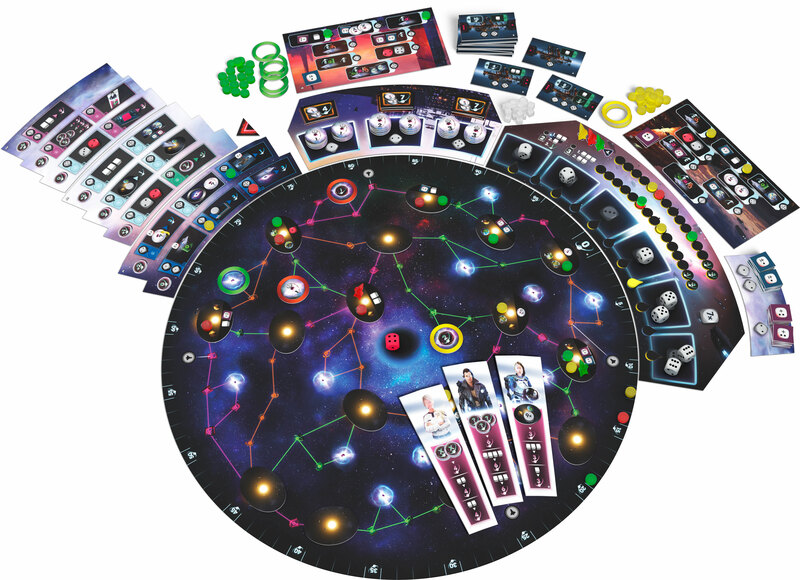 The first and most basic is moving your ship around on the big round galaxy board. The higher the value the longer you can move. Moving through the star systems allows you to place station tokens (that can be worth a lot of points at the end of the game). Ending your move on one of the pulsars allows you to place a circular claim token in your player colour on it. Claiming pulsars is (as the title of the game suggests) an aspect of the game. After you claim a pulsar, you can then spend another action to claim a gyrodyne (again higher value dice will give you better gyrodynes). These gyrodynes can then be placed on one of your claimed pulsars. You can then spend a 3rd action to activate your gyrodyne, making it active. This will generate points for you at the end of every round. Again, the better the gyrodyne the higher value dice you need to activate it. This is one of the main ways to get points throughout the game, but it does require an investment of 3 actions. At the beginning of each game a technology board is assembled (it has 3 tiers and each tier is a double-sided board). Each of the 8 rounds of the game unlocks a new level of technology that will accessible to all players, if they spend the correctly valued dice. These technologies offer vastly different bonuses, ranging from permanent powers or one-time effects for the players who claim these. Your HQ board works on a very similar basis, but are unique to you, so no other players can access them. Transmitters is another thing you can spend your limited actions on. These will give you various bonuses (like the technologies), but are more focus towards points and engineering cube generation. Grabbing multiple of these can also give you more bonus actions. At the end of the 8th round final scoring happens, and the winner is of course the player with the most points. While the core rules offer a few standard ways to score points (chief among them having placed stations in as many different star systems as possible), it is worth paying extra attention to the 3 random tiles at the start of the game. They’ll provide you points if you need a certain threshold, for example having 9 stations or 2 different gyrodynes. If you achieve this threshold you can spend engineering cubes to get even more points. So, you have to be careful about spending them all on bonus actions. Pulsar 2849 is a very well designed game. It has so many moving parts, but it all intertwines beautifully. The core dice drafting mechanism is very well done, and always leaves you with interesting options. There are so many different ways to score points and so many different strategies to try out. Will you go for exploring the galaxy and build stations, harnessing the energy of the pulsars with your spinning gyrodynes, or will you focus on the goal tiles, technologies, your HQ or transmitters? So many things will give you points in the game, and that’s a good thing, it adds a feeling of accomplishment and makes you feel clever. The game offers almost as much variability as there are stars in our galaxy. With the 6 double-sided technology boards, the 4 double-sided HQ boards and the 6 double-sided goal titles each game will feel different and offer new challenges and opportunities. I really applaud this kind of design, it gives the players that love the game even more incentive make it hit the table again and again. It’s not a casual game by any means, though the rules are not overly complicated the game itself is not easy to master. All of the variety and opportunities for scoring points can seem daunting at first and figuring out the ideal action for you can be quite the brainteaser. If you love these kind of decisions I’m sure you’ll love this game. For me however the game does feel a bit too overwhelming, not that it’s over engineered, there are just too many options and strategies for me to sit down and have a relaxing time playing it. If you know me and my taste in games you know that art and the visual, and that mechanisms and theme theme tie in together, means a lot to me. I feel that Pulsar 2849 lets me down a little bit on both accounts. I don’t know why space games have to have such boring art (I know space is big and black, but that doesn’t mean that everything in a game in space has to be black and bland). Even with these complaints I still think it’s a very good game. If you have no problem with the things I mention above I’m pretty sure you’ll love the game and I encourage you to go out right now and buy it. The basic rules for Pulsar 2849 are not that complicated and the rulebook is well written. The game however offers lots of choices and different technologies each round (and even more choices if you add the HQ boards). There are lots of icons you need to understand and all the technology options have to be explained.